Description: Several licenced Fisher-Price books were made featuring Little People Characters. 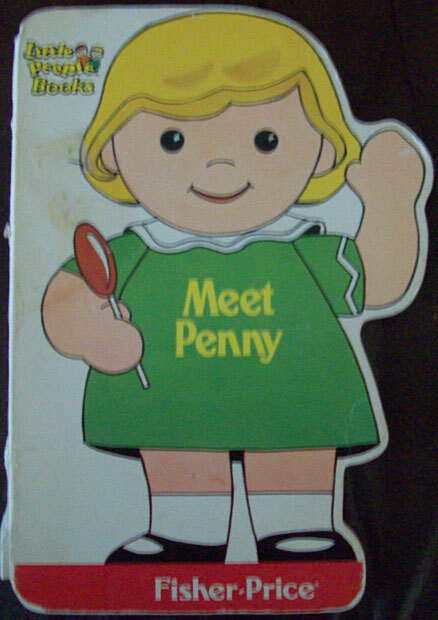 The "Meet Penny" book is a shaped hard cover book with brightly colored realistic Little People characters. Designed for children ages 2 to 5 years old. FPT5206 - Hard cover 12-page shaped book with a white cover and a picture on the cover of a Little People Penny figure (girl with blonde hair wearing a green dress). The top left corner of the book is marked "Little People Books". The bottom edge of the book has a red bar marked "Fisher-Price" in the center in white. ©1986 by Fisher-Price. Written by Stephanie Calmenson. Measures 8-3/4" tall x 6-1/8" wide. ISBN #0-87135-152-8.